Thanks to Save the Confluence for sharing this photo. After more than 200 miles since the weekend, the Awareness Walk to Save the Confluence has made it to Window Rock. Walkers quickly set up shop at Route 12 and Highway 264, to supportive honks from drivers acknowledging their signs. The trek, which began Saturday at The Confluence of the Little Colorado and Colorado Rivers at The Grand Canyon, on the Navajo Nation, resulted in an outpouring of support. 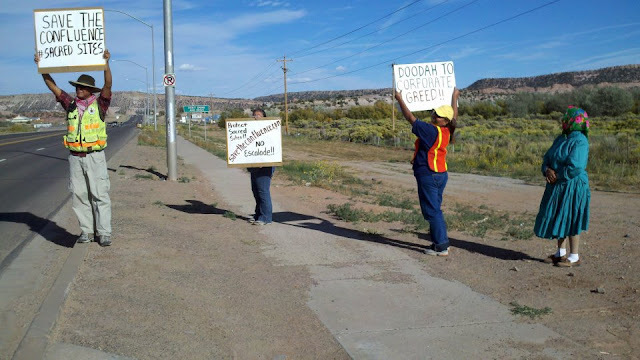 That included a news release from The Hopi Tribe stating their strong opposition to The Escalade Project, which would take 420 acres away from Navajos who spent 50 years under the Bennett Freeze living in Third World conditions, and awaiting the day they could rebuild their homes there, and which would also threaten numerous sites sacred to the Hopis, Navajos, Zuni and other tribes.